Gürzenich-Orchester Köln/Dmitri Kitajenko [Kitaienko] [Kitaenko]. 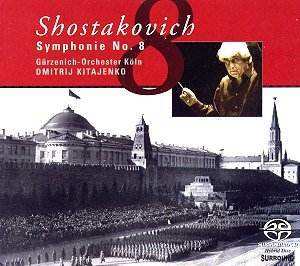 The symphonic edifice that is Shostakovich�s Eighth Symphony seems to become more and more impressive on every hearing � especially in as dedicated an account as this one. The Cologne orchestra�s recordings with James Conlon on EMI of Zemlinsky have in effect put them on the musical map properly (their music director from the 2003/4 season is Markus Stenz). It is with the distinguished Russian conductor Dmitri Kitaenko that they are to record Shostakovich�s complete symphonic cycle. Capriccio�s recorded sound is exemplary � this is a Super Audio CD Hybrid Disc that plays on all SACD and CD players. There is a terrific space around the sound, yet all is crystal clear � the engineers deserve only the highest of praise. The first movement of the Eighth Symphony is a terrific half-hour journey from darkness to � well, a different shade of the same darkness. The oppression of the opening reveals that Kitaenko will show no mercy in his reading � there will be no blurring of edges. Yet along with this visceral aspect is an awareness that this is the beginning of a very long journey (although the complete duration is only 70 minutes, periods of composed stasis can in effect suspend time). Kitaenko relishes the contrasts inherent in Shostakovich�s world - harmonies can be piercing and shrill, with vivid orchestration glaringly highlighted. A particularly impressive moment comes at around 10�53ff, where violins become tremendously and, indeed, scarily disembodied. A pity that at 18�10 there appears to be an edit (there is a significant shift in acoustic space and the immediately ensuing passage loses the �live electricity� that characterises its surroundings: suddenly we are studio-bound). The plaintive extended cor anglais solo a little later almost makes up for this, though. Expressive and the essence of lonely desolation, it leads to the very intense final moments (and there is proof this is live as the trumpet very nearly splits at 27�01 � not quite a split, but certainly near the edge of the note and very definitely not dead-centre). A grimly determined Allegretto is not quite as luridly grotesque as it could perhaps have been, but it remains an impressive performance with a perfectly-timed ending. If the third movement is again not as visceral as with some other conductors, it is fascinating because it emerges as what I described in my listening notes as a �Picasso-like dance�, referring to the jerky, disjunctive accents. The trumpet at 3�29 could certainly have been more of the �clown� � this is surely a circus-interpolation here (similarly the �oom-pah� accompaniment could have been a bit more bold, a bit less ashamed of itself). The final two movements together provide the apex of this recording. The opening of the Largo (the fourth) will show any decent hi-fi off to great advantage, but it is the musical qualities that really impress. The disjointed effects, the true pianissimi and the concentrated, hallowed, even hymnic lines are all mesmeric. The (excellent) playful bassoon of the fifth movement�s opening comes as something of a relief (the effect is more cartoon than circus now). Kitaenko�s way with this movement is remarkable, as he maintains the intensity throughout its quarter-hour span. Gestures make their mark (try the scale at 8�14-8�20, leading to percussion crescendi and massive orchestral screams) while the glassy ending leaves the listener feeling the correct amount of disquiet. Like so many great works that encompass a wide emotive range, it is well-nigh impossible to find any one recording that one can just say, �Buy this one�. Perhaps the exception is the Mravinsky on BBC Legends BBCL 40022, a two disc set which also includes Mozart�s Thirty-third Symphony. But there is no doubting that Kitaenko�s strengths very definitely do outweigh the weaknesses, and any slips due to live performance are certainly swept under the aural carpet because of the �live� effect. Ideally one should own both.